Night of November 9, we will be able to witness more singing skills that will stop us. This is the 4th episode of The Voice of the Philippines Season 2. The Blind Audition continues. For the record, Team APL already has 3 artists, Team Lea has 1, Team Bamboo has 3, and Team Sarah 2. 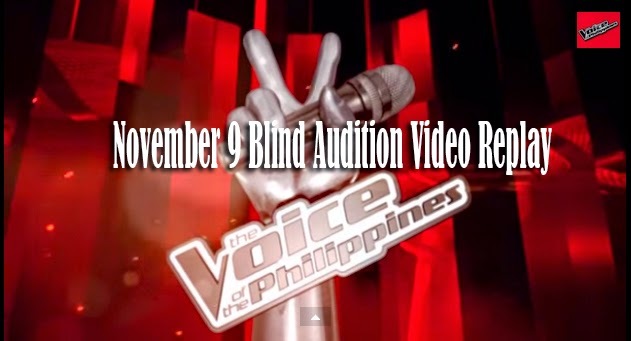 Last night we have witnessed the 3rd episode of The Voice of the Philippines Season 2 Blind Audition wherein some artists made it and some didn't. Despite the fact that there were artists who failed to be included in the group of any of the four coaches, one thing’s for sure, all of them did their best for the sake of dream and ambition. The Voice of The Philippines Season 2 continues to attract talents of various singing styles to take up the challenge in the Blind Auditions. Coaches were ready to fight each other to gain an artist for their limited slot. On November 9, 2014, five artists were given a chance to move on to the next round and work with their chosen coach. Roda Del Rosario is a mother and wife who usually does gigs with her husband. With the song ‘Araw Gabi’ she had put the coaches into a quiet atmosphere. Known to her friends and family as Dang, Del Rosario had a hard time choosing between lea and Bamboo, but in the end she had chosen Bamboo who said that he was honoured to be picked. Leah Patricio idolizes Coach Lea and by singing sung ‘I Will Always Love You’ as her piece, she had successfully caught her idol’s attention. Filled with tears, the artist received a hug and praises from her idol who is now her coach. Miro Valera was a member of the band local Stonefree. ‘Ticket to Ride’ is his ticket to the coaches’ hearts which made Bamboo and Lea to turn their chairs. H he picked Lea with a hope that he can develop his talent at its fullest with the help of the veteran singer. Monique Lualhati wanted to help her sister and she sees The Voice as a way to do just that. When I was Your Man’ was the piece she picked to get through the Blind auditions. It was towards the end that Sarah and Apl de Ap turned. She was confused but she picked Sarah because she felt like she will be able to enhance her talent more. Jason Desiata swooned every one with ‘ Stay With Me’. Jason had chosen Sarah which seemed to surprise her. The first artist will move on to the Battle Round and will go head to head against each the other artist in the same camp they are in. Coaches will have a chance to steal an artist in the battle round.